Find the ideal photocopier solution for your business by comparing quotes. Quality, affordable technology since 1908. Brother is one of the best known technology brands in the world today. The company was started by two Japanese brothers (hence the name) in 1908 but today has more than 50 sales sites and 17 production sites in 44 countries. Brother UK is based in Greater Manchester and manufactures a range of technology products for both domestic and business use. Brother are renowned for manufacturing high quality technology at affordable prices which means the machinery they produce tends to sit in the ‘low to moderate’ volume bracket, and is best suited for domestic use or small offices. However, they do offer a small range of photocopiers and printers for medium sized businesses and large, Workgroup models with high volume capacity. The majority of the office machinery they produce is multi-functional or MFP. This means they are capable of printing, copying, faxing and scanning. Get 4 Tailored Copier Quotes Today. What kind of quotes are you looking for? What colour output do you need? 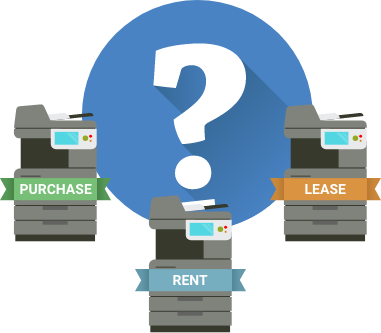 Our Buying Guides will help you understand the different photocopier arrangements including renting, leasing and purchase so you can make the right choice for your business.